Showing 15 articles from January 1, 2013. Happy New Year! We were with the grand-boys for Christmas but I heard that there were nearly 90 people at the Community Dinner. I believe that’s more than attended the Thanksgiving dinner. I know I say this every year, but there’s just nothing quite like these community feasts! While this is being written, we look forward to a fun New Year’s Eve chili dinner at the Café. Unlike other water-based cultures, the Cowlitz did not normally station their permanent villages near the water’s edge, but on the contrary, they usually built them on the river’s bluffs in close proximity to their horses grazing on the adjoining prairies. ToledoTel’s 5th HDTV Giveaway drawing by Mayor Jerry Pratt at Town Hall meeting 6PM Jan. 7. Benefits Toledo Food Bank. Visit www.toledotel.com or 864-4552. After a Christmas full of family gatherings, good food and lots of presents, it’s time for out with the old and in with the new! And speaking of old, I recently revisited the "Access Newspaper" website through our local Timberland Library. Looking into the past has always given insight to the future of Vader. If you are a Library card holding member, there’s tons of information you can access while home-bound during the blah days of winter. If you’re not a member and don’t wish to subscribe for a year, they do have rates that can accommodate a week, month, 6 months etc. Try it, there is a lot to offer. Winlock has been taken out of the equation after the Vader City Council chose to pursue temporary law enforcement coverage from Lewis County during a special meeting Dec. 26. As Warm Springs, Ore., Officer Lonny McEwen remains unable to entertain the position of Vader Police Chief, council members voted to ask for 30 days of coverage by the Lewis County Sheriff’s Office starting Jan. 1 at a rate of $55 per hour with a three-hour minimum charge. 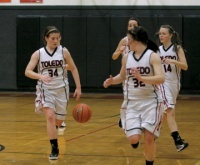 Anyone in the Toledo High School Gymnasium Dec. 21 must have been confused. It was the team in black that dictated tempo, applied intense full court pressure and hit shots like the rims were two-feet wide. In reality, Kalama came to play as they left the home-standing Indians in their wake with a bruising 56-41 loss in 1A Trico League play. A ceremony was held Thursday night, as the Toledo High School girls basketball team played Toutle Lake, to honor the retirement of Assistant Coach James Tharp (pictured), who has spent 25 years with the basketball program. Despite a 66-44 Trico League loss to Kalama Dec. 21, Toledo girls Head Basketball Coach J.B. Ewers was not in a particularly bad mood. "Our offense is improving," said Ewers. "That was the best second half of offense in a couple of years." Toledo/Winlock/Onalaska Wrestling Coach Pat Jones said one of his biggest concerns with his bevy of local wrestlers is finding them good competition. 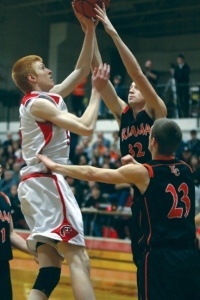 "I beg Chehalis and Centralia to come and wrestle with us," he said. "I tell them we will take it easy on them". A horse has been euthanized after being struck by an SUV near Toledo Dec. 26, according to the Lewis County Sheriff’s Office. The horse had wandered into the street on the 400 block of Toledo-Vader Rd., west of Toledo, and at around 9:20 p.m. it was hit by a westbound 2004 Ford Expedition, driven by a 54-year-old Castle Rock man. Interested in protecting your family and neighbors from fire and other calamities? Lewis County Fire District 2, based in Toledo, is seeking qualified and available volunteers to serve with their regionally-recognized staff of emergency responders. Lewis County was home to some nefarious and outlandish crimes in 2012. Metal thieves were getting bolder, car thieves were getting faster and gun enthusiasts were practicing less care with their firearms. But while some crimes seemed a surmounting task to investigate, our boys and girls in blue (sometimes green) were offered a leg up by certain criminals who may not have known what they were getting into. Steven A. Maggard, 41, of Toledo, is being sought by law enforcement on $3,000 in warrants. Toledo’s local tavern is transforming into a youth and family oriented restaurant under new ownership this year. 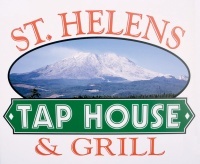 Harry’s Place, at 112 Ramsey Way, was sold to local entrepreneurs Chris and Callie Fraser and is reopening today as St. Helens Tap House & Grill.